21st Century Library Blog goes to Denmark! It is with much pleasure that I announce that I will be the closing keynote speaker at the Danish Union of Librarians’ annual conference “Snapshot! 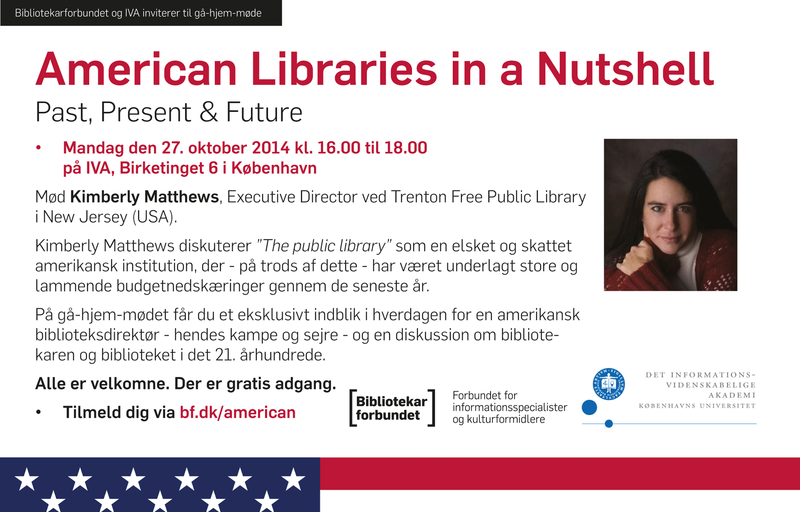 – The Librarian in 2014” on Sunday October 26, 2014 in Nyborg Strand, Denmark. The Conference announcement is at this link. The Danish Union of Librarians (“Bibliotekarforbundet”) conference will focus on “the professional dna” of the librarian – focus on the profession, on the skills and the identity of the librarian. The blog posts that caught their interest and generated the invitation were written by my father, Dr. Stephen Matthews, and include: “Five Challenges Every Librarian Must Face” , “A Sixth Challenge Every Librarian Must Face”, and “You May Be A 21st Century Librarian If You”. They are exceptional blogs and remain some of the top visited on this site. Based on each of our schedules, it was determined that I would attend and make the presentation. In addition to the conference, my time with the librarians of Denmark will include visits to various libraries, a lunch at the Librarian House, an interview with “Perspektiv” (Perspective), the magazine of the Danish Union of Librarians, and last but certainly not least a 2 hour presentation on the past, present and future of American Libraries at the University of Copenhagen’s Royal School of Library and Information Science. Stay tuned to hear more about the upcoming trip, my experiences with the Danish Librarians, and more!! For additional fascinating information about the Danish Librarians Union visit this link.